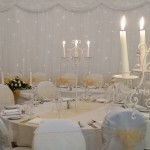 Here are a couple of photos which show our 9 metre wide white backdrop in the Manor Suite of the Holiday Inn Corby Kettering. 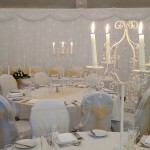 The chair covers are from Yvonne at Sitting Pretty. If you would like more information on this and our other services, please contact us. This entry was posted in News on February 22, 2015 by April Andrews.